At thirty-one, with three children and a full-time job, life had taken its toll on me. I was not getting enough sleep and seemed to be less focused by the day. My body was taking a toll on me especially during my menses. Something needed to be done very fast. After months of visiting the doctor with no positive results, I decided to do some more research on my own in a bid to find out what was going on. That’s when I discovered Nano Singapore’s Women Vitality Formula. Without a doubt about it, I was very skeptical of all the benefits that this women multivitamin formulation promised. The product is specifically formulated for women and promises to boost the immune system. The first thing that really impressed me about the product was that it contained at least a two-month worth dosage. This was a great incentive since my line of work keeps me busy hence I can easily forget to refill my dosage. In the first few weeks, I did not notice a greater difference although I slept better. By the end of the second month, I could easily pull through my days, and I was more focused at work. The greatest moment for me in this journey was when my four-year-old son told me I looked happier and I was more active. I almost broke down on that day, my commitment to feeling better was paying off. I can confidently say that I visit the doctor less times due to a boosted immune system. Lastly, I barely experience complications and pain during menstruation. I am off pain medication and easily pull through those grueling days of the month. Contained in 60 capsules, Nano Singapore’s Women Vitality Formula is made up of an all-natural ingredient list. The major active ingredients include Echinacea, goldenseal root, spirulina and garlic, green tea, grape seed, black currant, pomegranate, bilberry, hawthorn berry, and cinnamon bark. These list of ingredients provide a great set of vitamins such as A, C, D, E, B1, B2, B3, B6, and B12. All these work in sync to boost the immune system. Other major nutrients include; zinc, manganese, selenium, chromium, molybdenum, and magnesium. 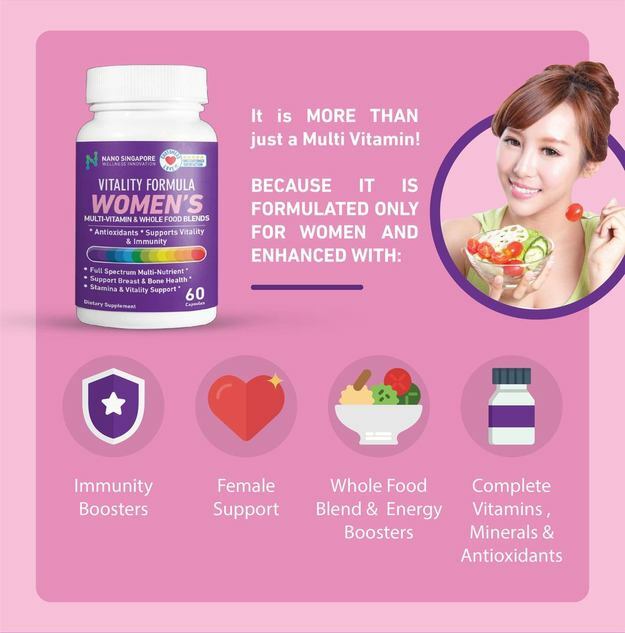 Interestingly, unlike other Multi-vitamin products available in the market, Nano Singapore’s Women Vitality Formula contains ingredients that are able to work together in great synergy. Goldenseal, for instance, is a well-known tonic compound which promotes better digestion. The product has been known to be great for women since it treats vaginal pain, inflammation, and menstrual complications. On the other hand, spirulina is a great antioxidant which improves endurance and also great for menstruation. Finally, Hawthorn is a great antioxidant, improves the hearts functions and boosts energy in the body. The formulation is available online at Qoo100’s website. Details including shipping information are well described on this website. The customer service experience is worth noting and leaves you wanting to purchase more. This for me was a guaranteed plus since I dislike online shopping. Be sure to leave some comments in the comments section detailing your journey with this product. Healthy women directly translate to healthy nations. For those that haven’t heard about Singapore Health Supplements. Singapore is a pretty amazing country often called the “Shangri -La of the East” . Singaporeans enjoy one of the highest healthy life expectancies in the world, ahead of the USA, Switzerland, South Korea & Germany (WHO 2017). They are also the happiest country in the Asia Pacific since 2015, ahead of Bhutan (UN-World Happiness Report 2017).